Enerpac (A Division of Actuant Corp) has partnered with Cooper Fluid Systems to provide mobile audit and maintenance services to time-starved mining, energy and infrastructure construction worksites in Queensland’s Bowen Basin. The two companies have teamed up to introduce to Queensland’s Bowen Basin an innovative service vehicle with the comprehensively equipped Mazda BT 50 mobile workstation that offers testing, tool performance verification (to original calibration), certification and other widely needed technologies, helping save busy customers time by bringing to their workplaces services vital to safety, reliability and uptime. 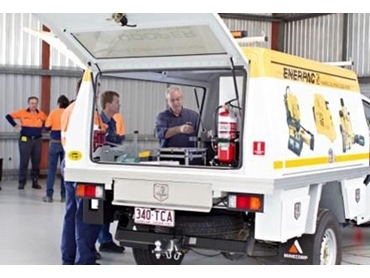 Handed over by global high pressure hydraulics specialist Enerpac to Cooper Fluid Systems recently, the mobile workstation is the first such vehicle to be introduced to Australia as part of a worldwide fitout by Enerpac. The mobile service will bring to the worksite a comprehensive range of sophisticated test and maintenance technologies that companies would otherwise have to access off-site, piecemeal and frequently with delays to equipment in regular use, including bolting and lifting technologies. Enerpac National Bolting Manager, Mr Pat Molloy explains that Enerpac’s technology expertise and Coopers Fluid Systems’ service expertise have been combined into a single professional package containing all the tools and expertise to do the job. This comprehensive mobile service facility can be delivered where it is needed, when it is needed, without busy companies having to send tools off-site. Describing the service initiative as particularly timely, he adds that resources companies nationally strive to sharpen their competitiveness by avoiding downtime and optimising their safety and throughput. Services contained within the vehicle include technology for audits, tool performance verification and certification of all hydraulic tooling commonly deployed on mining, energy and infrastructure construction worksites. The tooling comprises of widely used hydraulic torque wrenches such as square drive and low profile types, which require audits and verification of accuracy for optimum performance and safety; hydraulic torque wrench pumps, including air and electric models; pumps of all types, including hand, air, electric and petrol-operated; widely used tools including pullers, benders, presses, nut splitters and spreaders; double and single-acting cylinders and jacks, plus hollow and aluminium cylinders; and hoses and fittings for all hydraulic tools to ensure they comply with safety and reliability requirements, and are rated for 10,000 PSI working pressure. According to Mr Molloy, the precision hydraulic tools greatly enhance the safety, reliability and cost-efficiency of vital tasks, including lifting, forming, fabricating and bolting of plant and machinery ranging from pipelines, tanks and pressure vessels through to mobile machinery such as heavy trucks, earthmoving and tracked vehicles during servicing and maintenance. However, all precision tools need to be periodically tested to determine whether their output remains accurate, followed by correction of any tools requiring recalibration. As materials wear and age, the changes in friction inside the tool will change from the original manufacturer’s guidelines. The auditing and verification procedures correct these potentially hazardous errors. Fully trained in the procedures, Cooper Fluid Systems’ technicians employ proven traceable methods needed for repairing and verifying precision torque equipment. A compliance certificate is provided when work is completed to help safeguard safety and maintain accurate records.